For over 40 years, Hobie Cat has been building up its leadership in the water-sport world! 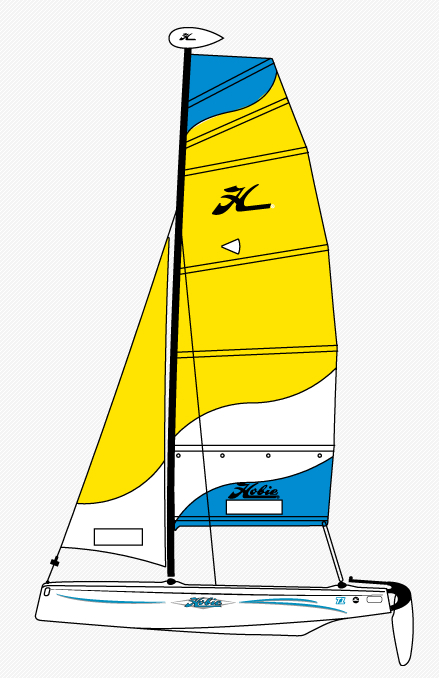 Hobie Cat still leads the market in technology and innovation which others can only try to imitate. Easy to transport, easy to handle, strong and safe, Hobie Cats have everything to seduce the public. Hobie Cat has been the leader of its industry since 1967, and still maintains its position, counting on the excellent quality of its products and the high level of its service. Nowadays, over 150,000 people are sailing on Hobie Cats. More than a boat, it has become a true cult symbol of leisure and fun. 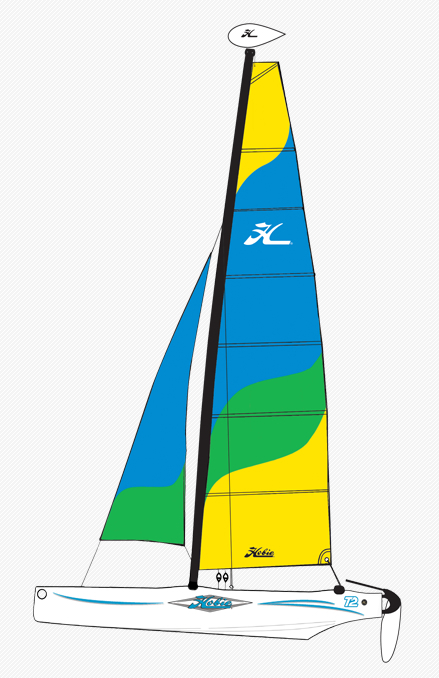 Hobie Cat Centre Ireland are Hobie Cat's only Official Dealer in Ireland. We offer a range of Hobie Sailing Catamarans and we can help you to choose which one is right for you. 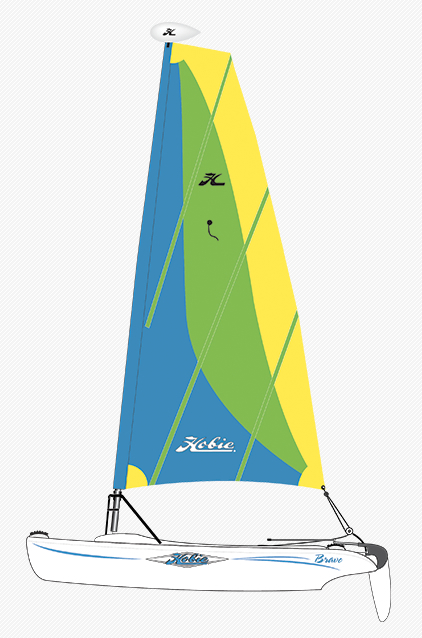 We are also able to offer any proud new owner of a Hobie, specialised training on the product you've just bought. This is where our deep anchorage and easy access to Blessington Lake really matters. Beam: 1.35 m / 4'5"
Draft w/rudder Up: 0.23 m / 9"
The Dragoon is the result of the collaboration between sailing schools and Hobie Cat. 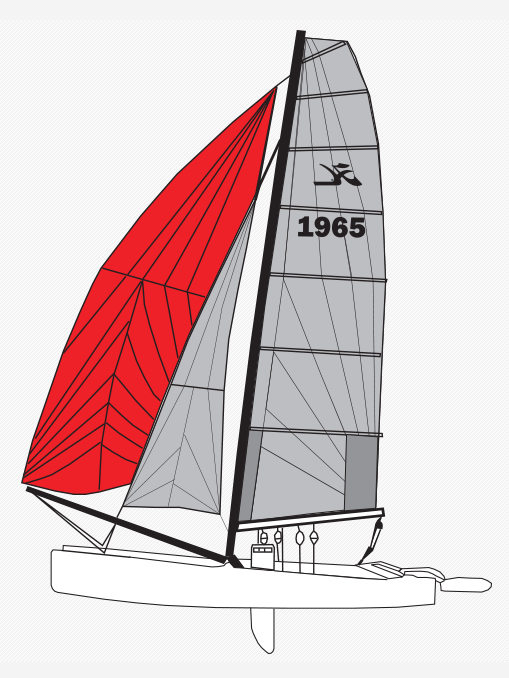 It has been specially designed to train sailors from initiation to performance racing. 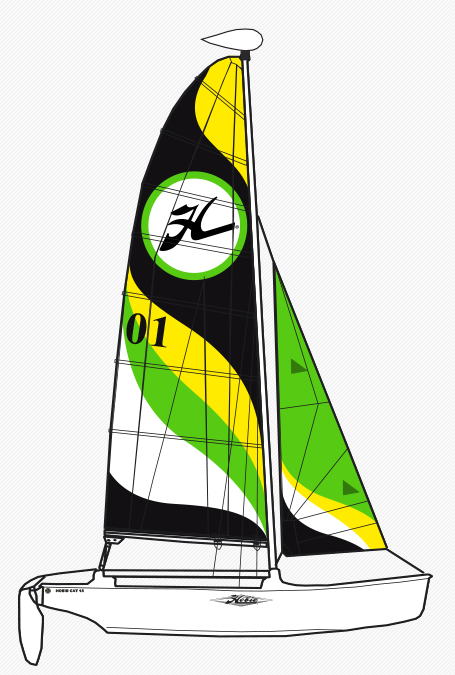 This catamaran is equipped to start sailing in regattas, then evolve into highly competitive competition. 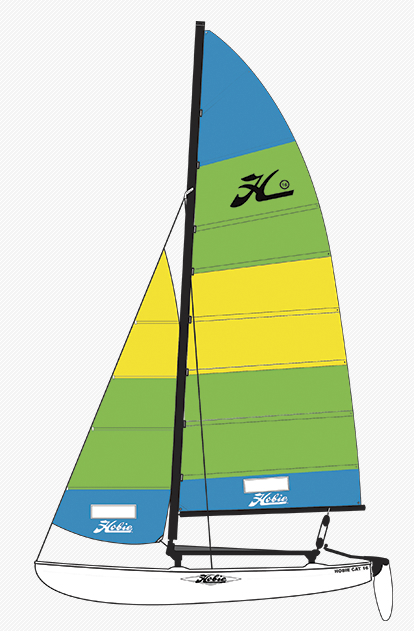 Length: 3.91 m / 12'8"
Beam: 2.20 m / 7'2"
Highly recreational and forgiving, the Hobie Cat 15 Club has a great floatability. With its wide platform, it is the reference boat for school sailing and safe family leisure. Length: 4.95 m / 16'4"
Beam: 2.26 m / 7'5"
Mast Length: 7.20 m / 23' 7"
Length: 4.04 m / 13'3"
Draft w/ Rudder Up: .25 m / 10"
Mast Length: 8.07 m / 26' 6"
Length: 5.11 m / 16'9"
Beam: 2.41 m / 7'11"
Created in 1995, the Hobie Tiger rapidly became an ISAF International Class. Always as well performing, it is constantly optimized. It is an excellent boat for mixed teams. The small jib and spinnaker option allows performance for smaller crews without compromising the performance for larger crews. 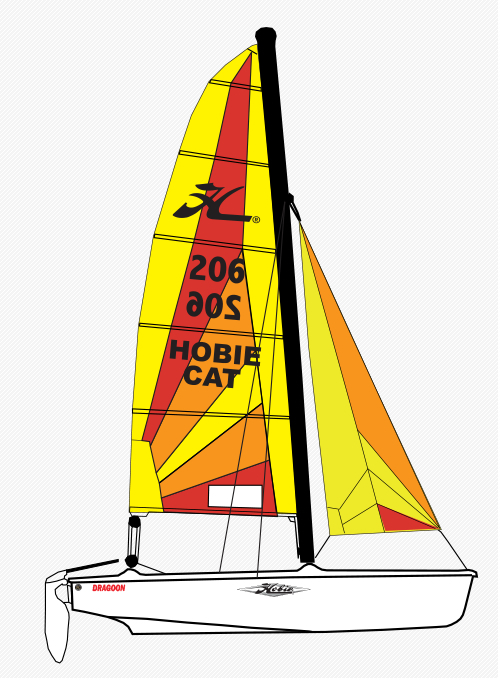 A majority of top cat sailors have once sailed a Hobie Tiger. The Tiger fleets are particularly large in Europe, United States and Australia. 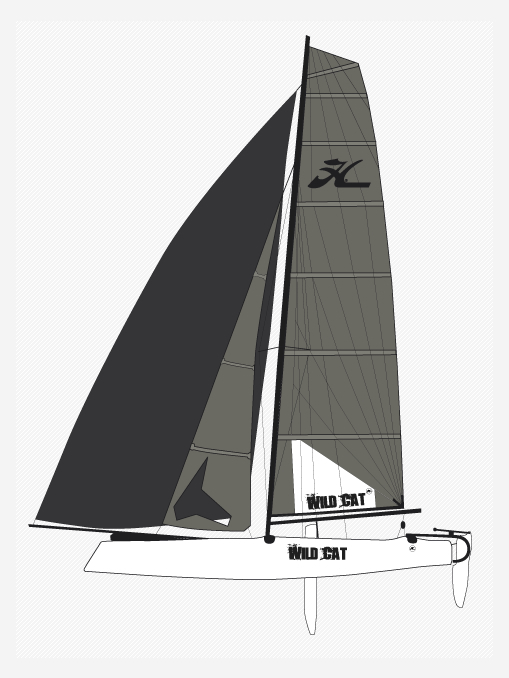 Beam: 2.60 m / 8'6"
Draft w/ Rudder Up: .18 m / 7"
The Wild Cat is your ticket to all-out thrills. Simply put, speed is addictive. Savor some windy-day trapeze time and your brain quickly acclimates to quick closing times, and rapidly advancing horizons. The Wild Cat—Hobie Cat Europe’s no-holds-barred Formula 18 class killer—is designed to efficiently feed your adrenaline addiction. Elegant, functional touches include wave-piercing bows, an integrated wing-mast section, high- aspect ratio daggerboards and rudders, dual trapezes, a spinnaker launching-and-retrieval system and seriously fast fiberglass hulls. Weight the trapeze wires and the Wild Cat immediately delivers real-world lessons in “evolving” apparent-wind angles. Caveat emptor: face-splitting smiles and unadulterated good times included! Beam: 2.59 m / 8'6"